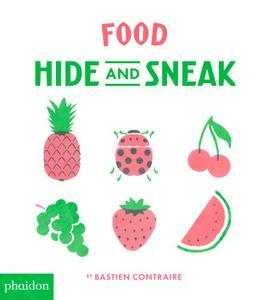 Bastien Contraire’s Hide and Sneak series of board books has a new addition: Food Hide and Sneak! Illustrated in bright shades of watermelon pink and watermelon-rind green, each page has a hidden secret. A visual game of hide and seek for babies and toddlers, on every page, Contraire sneaks in an item that “does not belong.” Perhaps there’s a sneaky umbrella hiding in a line-up of ice cream cones, or a ladybug hiding among rows of fruit. With its clean layout and stylistic design, you’ll be looking twice to find the item that’s hiding sneakily among its counterparts. A great first book for toddlers learning to read visual differences in illustrations. Don’t miss Bastien Contraire’s other books in this series! See this review on the blog!